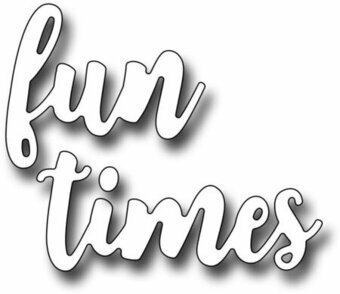 The "fun times" set of 2 dies cuts the following: fun (1.2" x 1") and times (1.75" x 0.75"). This is a perfect sentiment for scrapbook pages, too! 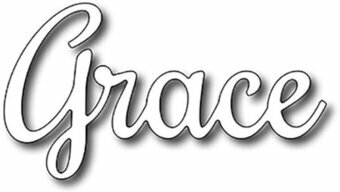 Frantic Stamper Precision Die - Grace. Size: 2.75" x 1.5". A simple act of kindness can have a lasting impact. Working with artist Jennifer McGuire, we developed this line of stamps and dies to encourage everyday acts of kindness that combine the joy of making with the joy of giving, offering a bit of kindness to brighten your day. Hero Arts Fancy Dies are intricate designs and stand-alone cutters that produce beautifully detailed cut-outs on paper. Reminiscent of a Hero Arts stamp design, Fancy Dies compliment stamps instead of matching them to broaden your stamping and technique options. They are made with intricate cutting surfaces from sturdy metal, are universally compatible with cutting machines, and work well with the complete Hero Arts line of stamps and papers. Handmade With Love is the perfect sentiment for so many uses. Place it on a tag to include with holiday baked goods, or on your canning jars. This design measures 3.25" x 1.875". Frantic Stamper Precision Dies are made in the USA and will work with most leading table-top consumer die cutting machines. Memory Box craft die featuring the word "Hello". 100% steel craft die from Memory Box. For use on cardstock, felt, and fabric. Cut, stencil, emboss, create. Use in most leading die cut systems. 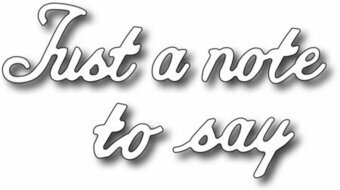 Set of 5 word dies to mix and match into a few sentiments: Just a note, Just to say, a note to say. The word "Just" measures 1.2" x 0.75" and the word "note" measures 1.125" x 0.5". We recommend combining this die set with some of our other word die sets for a variety of sentiments. Kaisercraft die featuring the sentiment "Celebrate". These steel dies will cut through cardstock, thin chipboard, felt, acetate, sticky back canvas, sandpaper, foam and much more! They work with virtually any die-cutting machine that will accommodate wafer-thin dies and are sure to become an essential ingredient in your paper crafting process. Kaisercraft die featuring the sentiment "Congratulations". These steel dies will cut through cardstock, thin chipboard, felt, acetate, sticky back canvas, sandpaper, foam and much more! They work with virtually any die-cutting machine that will accommodate wafer-thin dies and are sure to become an essential ingredient in your paper crafting process. Cheery Lynn Designs die. Size: 2 1/8" x 2 1/8" (54mm x 54mm). Using the dies interchangeably with stamps, you can create dozens of sentiments, perfect for friendship cards, mother's day cards, thank you cards and so much more. The words measure 3.5" long each. "Lovely" is 1" tall, and "Gorgeous" is 0.75" tall. Our Frantic Stamper Precision Dies work in most consumer table top die cutting machines such as the Cuttlebug, Big Shot, Vaggabond, Boss Cut, and Grand Calibur. Some dies may require the use of a metal shim depending on your machine. Penny Black craft die featuring the sentiment "Made With Love". Christmas themed Memory Box craft die featuring the word "Peace". 1.7 x 0.6 inch. 100% steel craft die from Memory Box featuring the word "Joy". For use on cardstock, felt, and fabric. Cut, stencil, emboss, create. Use in most leading die cut systems. 1.3 x 1.4 inches. This die can either be used reverse-cut style (cutting the words into your card front, leaving you with a window look), or use the letters to spell our "Cheers" in different configurations. The die measures 1.9" x 3". Our Frantic Stamper Precision Dies work in most consumer table top die cutting machines such as the Cuttlebug, Big Shot, vagabond, Boss Cut, and Grand Calibur. Shape Die - With Sympathy. Sentiment die for sympathy cards. Includes an outer die to layer the sentiment. 4 dies. Size: With: 1.45" x 0.75", Sympathy: 3.10" x 1.0". Penny Black Creative Die featuring the sentiment "From our family to yours". Stand Alone die. This is a (one of a kind) die collection with two hand written words and three small hearts. This set is wonderful for wedding, anniversary, Valentine's Day etcYou might also like our Ampersands 2 Dies. Approx. sizes: A. 2 3/4" x 1 1/8", B. 1 3/4" x 1 1/4", Smallest heart - 3/8" x 3/8". Approximate Size: Celebrate: 4.914" x 1.020" (125mm x 26mm). Celebrate with a Place Card. This fun and wacky wording will surely bring a smile. Made in America. Poppystamps craft die featuring the word "Love". Memory Box/Poppy Stamps craft dies are made of 100% steel. For use on cardstock, felt, and fabric. Cut, stencil, emboss, create! Use in most leading die cut systems. Craft die featuring the phrase "give thanks". Memory Box/Poppy Stamps craft dies are made of 100% steel. For use on cardstock, felt, and fabric. Cut, stencil, emboss, create! Use in most leading die cut systems. 1.1 x 0.6 inch give, 1.9 x 0.6 inch thanks. 2.8 x 1.5 centimeters give, 4.8 x 1.5 centimeters thanks. 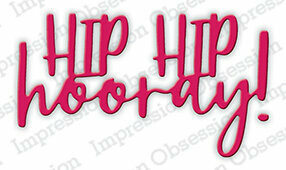 Poppystamps craft die featuring the sentiment "Hello". Craft die featuring the sentiment "Make A Wish". Memory Box/Poppy Stamps craft dies are made of 100% steel. For use on cardstock, felt, and fabric. Cut, stencil, emboss, create! Use in most leading die cut systems. 2.9 x 1.4 inches make, 0.5 x 0.6 inch a, 2.6 x 1.6 inches wish. Craft die featuring the phrase "Save The Date". Steel cutting die from Elizabeth Craft Designs. Compatible with most leading die-cutting machines. 4" x 6" set of Christian clear stamps featuring "Lord", "God", "Serve", "Glory", "Savior", and more. 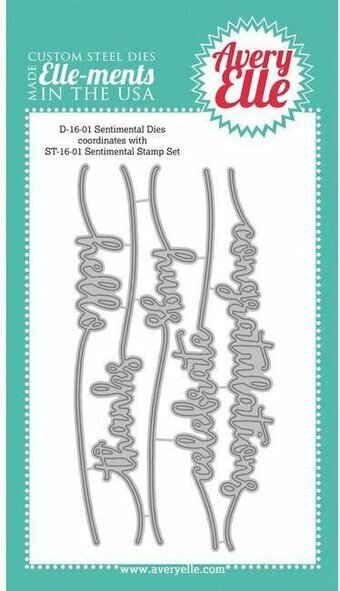 We are excited to bring you this all-inclusive set of Sentiment Labels and Strips dies. This set contains 7 dies in a variety of shapes to frame your stamped sentiments. With the variety of sizes and shapes, you're sure to turn to this set over and over again! Approximate sizes: Stitched Oval label: 3.625" x 1.125", Stitched scalloped circle label: 2.25" in diameter, Longest "torn" washi strip: 4.25" x 0.8", Uneven fishtail strip: 4.8" x 0.875". Our Frantic Stamper Precision Dies work in most consumer table top die cutting machines such as the Cuttlebug, Big Shot, vagabond, Boss Cut, and Grand Calibur. Some dies may require the use of a metal shim depending on your machine. Create beautifully designed corners on cards, scrapbook pages, photo mats and more with this Sentiment Mini Corner punch set from EK Tools. Use individually or interlock layers together for a unique look. These easy-to-use punches feature a paper guide so you know you are aligned correctly, and the compact design locks shut for storage. Set of 2 punches, 0.67" diameter each. Craft dies featuring the sentiments "Hello", "Thanks", "Hugs", "Celebrate", and "Congratulations". 5 dies tabbed together. Coordinates with ST-16-01 Sentimental Stamp Set. Our Exclusive Steel Dies are proudly made in the USA. Sentiments 1 Stamp & Die Set Happy Grams #4 Collection by Tammy Tutterow brings both worlds together of die templates and coordinating stamps to give these images life! These cling foam (EVA) rubber stamps are designed to be used with an acrylic block. This set includes four stamps with four coordinating etched dies. Happy Gram #4 Collection is a continuing series of wonderful heartwarming sentiments and phrases in handwritten form by Tammy Tutterow. See what she has in store for you in this collection and collect the ones that tug at your heart strings! Approximate Size: Happy Birthday: 4.10 x 1.05 in. 10.40 x 2.70 cm, Congratulations: 3.70 x 1.00 in. 9.40 x 2.50 cm, And Many More: 4.00 x 1.00 in. 10.20 x 2.50 cm, Congrats: 2.35 x 0.95 in. 5.90 x 2.40 cm. Shapeabilities Get Well Soon Scalloped Circle Etched Dies Thoughtful Expressions by Marisa Job is a set of two dies includes a sweet scalloped circle shape with a "Get Well Soon" sentiment. Thoughtful Expression Collection by Marisa Job brings heartfelt greetings and designs to your projects for a great addition and complement to Marisa's other collections. Spellbinders Shapeabilities cut, deboss, emboss and stencil with a single etched die template. Approximate Size: Get: 1.00 x 0.70 in. 22.50 x 1.80 cm, Soon: 1.41 x 0.55 in. 3.60 x 1.40 cm, Well: 1.50 x 0.60 in. 3.70 x 1.50 cm, Scalloped Circle: 4.05 x 4.05 in. 10.30 x 10.30 cm. Shapeabilities Thinking of You Scalloped Rectangle Etched Dies Thoughtful Expressions by Marisa Job is a set of three dies includes two detailed rectangle shapes and the sentiment, Thinking of You. Thoughtful Expression Collection by Marisa Job brings heartfelt greetings and designs to your projects for a great addition and complement to Marisas other collections. Spellbinders Shapeabilities cut, deboss, emboss and stencil with a single etched die template. Approximate Size: Of: 0.50 x 0.70 in. 1.30 x 1.80 cm, You: 0.90 x 0.60 in. 2.30 x 1.50 cm, Thinking: 1.80 x 0.80 in. 4.60 x 2.00 cm, Small Frame: 4.90 x 3.00 in. 12.50 x 7.60 cm, Large Frame: 6.71 x 4.80 in. 17.10 x 12.10 cm. This Originals die showcases the colorful style of Marisa Pawelko. Each medium Originals die measures 2 3/4" x 4 3/4" x 5/8" and is compatible with both the original Sizzix Machine (with one Cutting Pad) and the SophistiCut, BIGkick, Big Shot and Vagabond machines (with two Cutting Pads). All items sold separately. This Originals die showcases the imaginative style of Stephanie Ackerman. Each medium Originals die measures 2 3/4" x 4 3/4" x 5/8" and is compatible with both the original Sizzix Machine (with one Cutting Pad) and the SophistiCut, BIGkick, Big Shot and Vagabond machines (with two Cutting Pads). All items sold separately. Thinlits create dazzling detailed shapes for more creative cardmaking and papercrafting projects. These wafer-thin chemically-etched die sets are designed to cut, emboss or stencil a single sheet of cardstock, paper, metallic foil or vellum. They are simple to use, compact and portable for cutting at home or on the go. Use them for enhanced intricacy and to add a special touch of inspiration to all your projects. The Thinlits dies in this set were designed by Stephanie Barnard and are compatible with the BIGkick, Big Shot and Vagabond machines. Craft dies featuring the words "Love", "Happy Birthday", "Sunshine", and more. Thinlits create dazzling detailed shapes for more creative cardmaking and papercrafting projects. These wafer-thin chemically-etched die sets are designed to cut, emboss or stencil a single sheet of cardstock, paper, metallic foil or vellum. They are simple to use, compact and portable for cutting at home or on the go. Use them for enhanced intricacy and to add a special touch of inspiration to all your projects. The Thinlits dies in this set are compatible with the BIGkick, Big Shot and Vagabond machines. Features the sentiments "Choose to shine", "Believe you can", and "Hello my friend". Thinlits create dazzling detailed shapes for more creative cardmaking and papercrafting projects. These wafer-thin chemically-etched die sets are designed to cut, emboss or stencil a single sheet of cardstock, paper, metallic foil or vellum. They are simple to use, compact and portable for cutting at home or on the go. Use them for enhanced intricacy and to add a special touch of inspiration to all your projects. The Thinlits dies in this set were designed by Stephanie Barnard and are compatible with the BIGkick, Big Shot and Vagabond machines. Love themed Penny Black Creative Die featuring the phrase "Soul Mate".